Integration has become an X factor in aerodynamic considerations for bicycle design from seatposts to brakes to electronic shifting units. 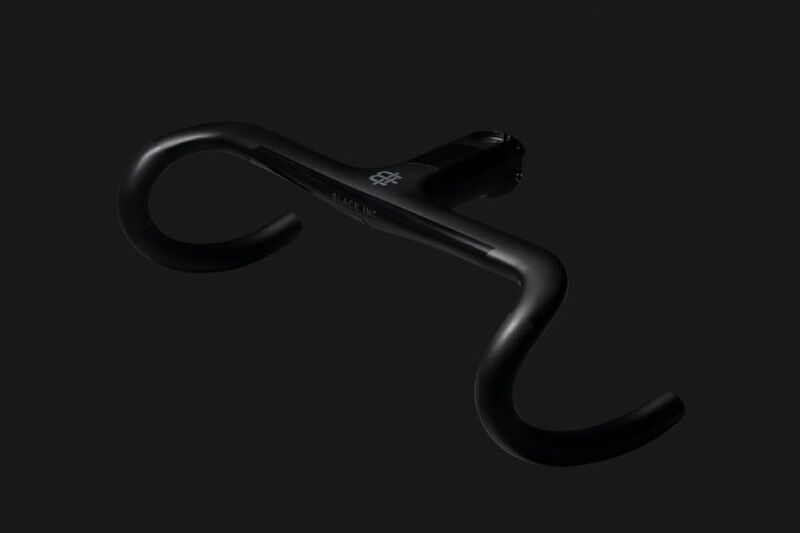 As the most substantive leading feature of a bicycle, an integrated handlebar/stem unit provides 10 fold aerodynamic gains over cylinder shapes. Not only do they dramatically reduce drag, they increase front-end stiffness for a more confident riding experience. These two details come together in Black Incs integrated barstem. The advantages of the integrated barstem, both functionally and aesthetically, are enhanced with our cable routing options, which further streamline the front of the bike. And while aerodynamics are the defining concern for Black Incs continuing engineering aspirations, ergonomics matter a lot to us You have to be able to wrap your hands around the bars! Our 125 mm of drop and 80 mm of reach offer the perfect fit in all riding positions, with a drop flare of 3 degrees and a top section backsweep of 2 degrees. The integrated barstem feels like a custom-molded bar the tops are the perfect shape hands can cradle for comfort and security yet aerodynamic in all the right ways. The drop flare makes a big difference for better comfort while during descending and sprinting and helps clear a riders wrists from contacting the upper bend while sprinting with a wider and with more substantial surface to grasp. The drops have a variable radius, continuous shape for comfort and ease of hand movement along for multiple positions for varied terrain. The geometry of the integrated barstem is the same as our Black Inc stem and handlebar together, putting hands and shifters in the same place but with a stronger and lighter junction between bar and stem. Its wide, big radius junction allows carbon fibers to be laid smoothly over a larger surface area for increased stiffness connecting to a substantial cross-section stem portion while the shallow aero profile bar portion offers road bump dampening. This barstem is full carbon, no inserts. We use separate aluminum nuts for the steerer clamp. This allows us to make a stronger and lighter bar without the intrusion of co-molded aluminum inserts. We use titanium screws and aluminum nuts in the steerer clamp. The steerer clamp is 42 mm tall (stack), however the clamping area is located in the lower 37 mm of it. The upper 5 mm are recessed 1mm. This is made so that a clean, flush headset top cap installation can be done, but ensures the stem clamps completely on the steerer. Otherwise, for a standard stem, without this built-in recess, it is recommended to add a 5 mm spacer on top of the stem. The cable routing is optimized for electronic setups, so that Di2 wires can be run internally, also using the new bar-end style junction box from Shimano. The new small connection box can be hidden inside the bar tops. The brake and shift (mechanical) cable housings run externally on a recessed channel. The barstem comes with a machined aluminum quarter turn computer mount (Garmin and Wahoo type) with 2-mount position for the Garmin version, so that larger or smaller computers can be used (Garmin 520 or 1000, for example). We also have an optional SRM mount version that can be purchased separately. For those not using a computer, there is also a blind cap for a smoother aesthetic.